As a complement to the online recruitment business, Quadrangle offers off-line placement services to middle and senior management, with revenues based on a success fee model. The division services the executive talent requirements of leading corporates, across different industries by actively involving in their search and selection process. Quadrangle has an established client base, which extends to over 150 companies across India and abroad with whom it works very closely. With a qualified team of recruitment professionals in every industry and every functional discipline, Quadrangle provides clients with high-quality talent for their organizations. It has built and sustains a reputation of excellence in all its verticals - executive search, management search, IT search, international search and KPO/BPO vertical. With a team of multidisciplinary consultants spreading across India and with specialty practice teams, it provides clients with seamless service in recruitment. 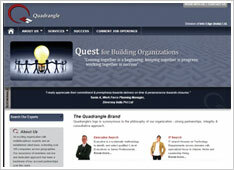 Quadrangle's distinctive edge also comes from its association with India's largest and oldest job portal, naukri.com. In keeping with its goal of becoming the preferred recruitment partner for its clients, Quadrangle adds value to its offerings through its excellent pre-client interview screening services, industry mapping techniques, market information and handholding relevant candidates till they join the clients.